MILAN -- Samuel Eto'o is leaving Inter Milan for Russian club Anzhi Makhachkala in a deal that likely will make the Cameroon striker the world's highest-paid soccer player. Eto'o will be given a three-year contract if he passes a physical scheduled for Wednesday, the Russian team said on its website Tuesday. Claudio Villa/Getty Images Russian club Anzhi Makhachkala is expected to give Samuel Eto'o a contract worth $29 million per season, surpassing Cristiano Ronaldo's estimated $17.4 million deal and Lionel Messi's $15.2 million. 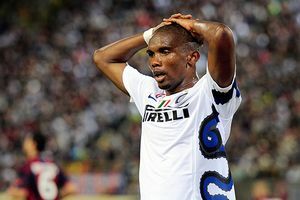 "Today an agreement was reached between the football clubs Anzhi and Inter for the transfer of Samuel Eto'o. The terms of the transfer fully suited both sides," Anzhi's statement said. While financial terms were not disclosed, Eto'o is expected to be paid $29 million net per season, eclipsing the estimated $17.4 million that Cristiano Ronaldo earns at Real Madrid and the $15.2 million that Lionel Messi is paid by Barcelona. After a week of negotiations in Milan, the transfer fee was reportedly set between $36 million and $39 million. The 30-year-old Eto'o has won three Champions League titles -- two with Barcelona and one with Inter. He is expected to join his new club Thursday to prepare for a match against FC Rostov. Inter did not make a formal announcement. "Tomorrow the deal will be formalized," Inter sporting director Piero Ausilio said, according to the ANSA news agency. Anzhi, from the troubled southern Russian province of Dagestan, is owned by billionaire oil tycoon Suleiman Kerimov. In Forbes magazine's latest list of the world's richest people, Kerimov's net worth was estimated at $7.8 billion, tying him for 118th place with Italian premier Silvio Berlusconi and family. Makhachkala is plagued by violence stemming from two separatist wars in Dagestan's neighboring region of Chechnya. Anzhi players live and train at a training camp outside Moscow and travel to Makhachkala for home games, flying about 1,250 miles 15 times a season. Anzhi's captain is 38-year-old Roberto Carlos, once the standout left back for Brazil. Inter opens the Serie A season against Lecce on Sunday. Eto'o led Inter with 37 goals in all competitions last season, having replaced Milito as the club's biggest scoring threat. He was a key member of the Inter side that won the Champions League in 2010, often accepting an attacking midfield or defensive role for then-Inter coach Jose Mourinho. Before joining Inter in 2009, Eto'o played five seasons with Barcelona.